ONE of the most prominent figures in the commercial, social, and public life of Nottingham about the middle of the fifteenth century was Thomas Thurland. He was Merchant of the Staple; was several times Mayor, an Alderman; a "Keeper of the Peace"; and the builder of Thurland Hall, afterwards known for a time as Clare Hall. His name is perpetuated by a street bearing his name, and which occupied part of the site of this palace of a merchant prince, which was second only in splendour to that of the Castle. This hall was located on the north side of Gridlesmith Gate, now Pelham Street, and covered an extensive area, including what is now Thurland Street. 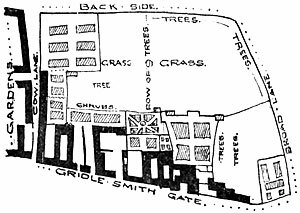 As will be seen by the rough plan the house and grounds covered the space between—to use present-day street nomenclature—Parliament Street, on the North, Pelham and Carlton Streets on the South, Clumber Street on the West, and Broad Street on the East. The area was about eight acres and three quarters. The principal portion of the frontage was opposite the stables of the famous "Blackamoor" hostelry, and covered the site of the buildings opposite the present-day "Journal Chambers." The Hall had its main frontage to the South, and extended northward behind buildings at the back of what is now Clumber Street. The grounds were fittingly laid out with garden-beds, with trees and shrubs on the grass-lands. Thurland was one of a number of men who benefitted largely by the action of Edward the Third (1336-1360), when he incorporated the Merchants of the Staple, which was one of the most ancient companies of merchants in England. The woollen trade was largely centred in Calais at this time; and Thurland was a Merchant of the Staple. He prospered exceedingly, and became a man of very considerable wealth and importance in Nottingham. Thurland was returned four times as Burgess in Parliament for Nottingham: in 1441, 1448, 1449, and 1450. He was Mayor of this town nine times, viz., in 1442-3, 1447-8, 1448-9, 1450-1, 1453-4, 1458-9, 1459-60, 1462-3, and 1463-4. In 1457-8 he gave twenty loads of Basford stone for the repair of the " Bridges of Hethbeth "—the Trent Bridge. During 1467-9 he was a "Keeper of the Peace," or magistrate; and in the first-mentioned year was appointed a collector of alms for "Hethbeth Bridge." In 1472-3 the King appointed him as a Commissioner for examining land, tenaments, &c, for the purpose of levying taxes upon them. We find that he contributed the tenth of the income of his freehold in Nottingham, which amounted to seventy-four shillings and sevenpence half-penny—a considerable sum at that period. This was the largest sum by far on the subsidy-rolls for Nottingham. He died about 1474-1477. Thurland Hall was built about the year 1458, and was the residence of the owner and his family. It was sold to Thomas Markham, son of Sir John Markham, of Cotham, standard-bearer to Queen Elizabeth's band of gentlemen pensioners. The hall passed by purchase to Sir John Hollis. 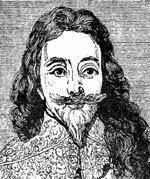 He was created Baron Houghton of Houghton in 1616, at the time of the King's first visit; and when King James paid his last visit to Nottingham the Baron was created first Earl of Clare. Thurland Hall then became known as Clare Hall, for a period. The first Earl of Clare was John, son of Denzil and Eleanor Holles. He was born at Haughton; and was a gentleman pensioner at Queen Elizabeth's Court. After serving against the Spanish Armada, and taking part in the expedition to the Azores in 1597, he fought in Ireland, where he received the honour of knighthood, and subsequently went to Hungary and fought the Turks there. He succeeded to the family estates in 1590, and two years later married a daughter of Sir Thomas Stanhope, of Shelford. He became Baron Holles of Haughton in 1616 and Earl of Clare in 1624. He died in Nottingham, at Thurland or Clare Hall, on October 4th, 1637. He was buried in the south transept of St. Mary's, at a spot which he had designated: "Here I will be buried." The Countess died November 18th, 1651. The first Earl was succeeded by his son John. He was born at Houghton, June 13th, 1595. He was M.P. for East Retford in 1624, and in two Parliaments of Charles the First. On September 24th, 1624, he married the eldest daughter of Horace, Lord Vere of Tilbury, who long survived him. He was Lord Lieutenant of the county, and from July 14th, 1642, was Recorder of Nottingham. Of him it is said that " he was very often of both parties, and never advantaged either." He received Royalty in 1662, as stated in the succeeding paragraph; died on January 22nd, 1665, leaving a son as his successor and several daughters, and was buried with his father in the south transept of St. Mary's Church, Nottingham. Thurland Hall was the temporary home of Charles the First. Bishop Trollope in his paper on the Raising of the Standard, printed in the second series of our "Old Nottinghamshire," says:—"On the 16th of August he (Charles the First) reached Lincoln, on the 17th Newark, on the 18th Southwell, and on the nigth he arrived at Nottingham. . . . The King's arrival caused the greatest excitement in Nottingham, as most of the inhabitants were still, to a certain extent, Royalists . . . . Followed by a considerable body of cavalry, he was greeted by the loud shouts of the people as he passed on towards Thurland House, the Earl of Clare's residence in Nottingham, which had been prepared for his reception. There he was waited upon by a large number of country knights and gentlemen at the head of their retainers, who had other wise expressed their regard for him only ten days before, through the medium of an address they had presented to their representatives in Parliament, Sir Thomas Hutchinson and Robert Sutton. With these were mingled other loyal gentlemen from a distance, among whom was the learned Gervase Holles. The next morning the King reviewed his cavalry—eight hundred strong. . . . Charles at once converted his mimic warfare into a reality by ordering his calvary to advance towards Coventry. The citizens of Coventry closed the gates of their town against the King's troops and the King himself. . . . Charles was forced to return baffled and disappointed. That night he slept at the house of Sir Thomas Leigh, of Stoneleigh. . . Such were the discouraging circumstances under which the King returned to Nottingham. Towards evening a procession was formed for the purpose of erecting the Standard on the'highest tower of the Castle . . . That night a violent storm arose, which blew down the Standard, which was regarded as an evil omen. Thinking that its retention within the Castle walls . . . might have had something to do with their coldness of conduct, Charles determined to remove the Standard thence, and to repeat the ceremony of its erection. Hence three days later, viz., on the 25th August, Charles, attended by his train as before again rode from Thurland Hall to the Castle " for the purpose of raising the Royal Standard again, for particulars of which Bishop Trollope's paper and other reliable sources of information are referred. " About a week after this event the King's stay at Nottingham reached its close. . . . The King left this town September 13th, 1642." The successor to John, son of the first Earl of Clare, was Gilbert, who lived from 1633 to 1689. His son was John Holles (1662-1711). During his father's lifetime he was known as Lord Haughton. He was an M.P. for the shire; a gentlemen of the bedchamber to William the Third; he married in 1690 Margaret Cavendish, coheiress of the Duke of Newcastle; was created first Duke of Newcastle-on-Tyne (second creation) in 1694; was created a K.G. in 1698, and was Lord Privy Seal from 1705 until his death in 1711.